Contact Doug @ (423) 408-3215 to schedule a viewing of this boat located in Johnson City,TN at www.RockinghamMarina.com. 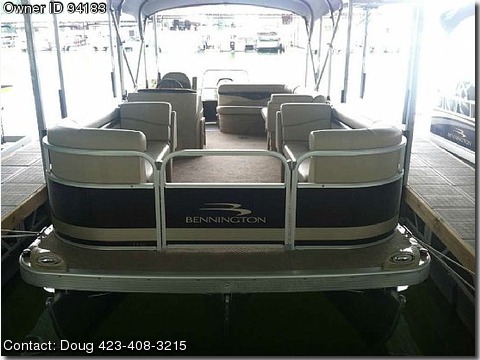 2012 Bennington 24 SLX:Cruising & Fishing. Bennington owners do not have to sacrifice quality when they choose to simplify. Select any one of our S Series models in a cruising or fishing layout and you will know you have stepped aboard a quality boat. Clean lines, carefully-selected amenities and consolidated floorplan choices make the S Series the first choice for customers who want to simplify. Add to the fun by selecting the optional Extended Aft Deck or the new Express Performance package to the 22 or 24 foot S models.